In the last few years, the Laboratory has worked on the identification of different genes and gene variants at the base of monogenic diseases, chromosomal syndromes and multifactorial diseases. Regarding monogenic diseases, the laboratory dealt with Progeroid Syndromes, congenital and familial lipodystrophies, Myotonic Dystrophy, cardiac and muscular Laminopathies, X-linked myotubular myopathy, Metabolic Diseases, Cystic Fibrosis and Spinal Muscular Atrophy. In this area, the Laboratory has worked on the development of protocols for molecular diagnosis (prenatal and postnatal diagnosis), contributing to the development of national and international guidelines, the development of innovative gene therapy protocols and the creation of cellular models useful for understanding molecular pathogenesis and to test new therapeutic molecules. As for chromosomal syndromes, the Laboratory has contributed to the mapping and cloning of several responsible human genes and to the study of the molecular basis of human syndromes caused by chromosomal deletions of the 22q11 region (DiGeorge / velocardiofacial syndrome) and 7q23 (Williams syndrome) and congenital heart disease. In the field of the Genetics of Multifactorial Complex Diseases and their complications, the Laboratory has dealt with Diabetes, Cardiovascular Diseases, Crohn's Disease, Systemic Lupus Erythematosus, Rheumatoid Arthritis, Psoriasis, Macular Degeneration and Osteoporosis. In fact, the Molecular Genetics Laboratory is part of the "Center of Excellence for the study of Genomic risk in complex and multifactorial diseases", whose purpose is to identify the genetic factors contributing to the susceptibility to complex diseases, to the development of their complications and to the variability in response to therapies (see below, Pharmacogenetics). Furthermore, the Genetics Laboratory is involved in molecular analysis (by next-generation sequencing approaches, NGS) of genes predisposing to the development of hereditary carcinoma of the breast and / or ovary and to cardiomyopathies and hereditary arrhythmic syndromes. The laboratory has also created several lines of induced pluripotent stem cells derived from both fetal cells (trophoblasts) and adult cells (skin biopsies). These lines are obtained from healthy subjects and from subjects suffering from monogenic diseases. Their specific differentiation into target cell types of different pathologies / conditions represents a valid model for the study of the pathogenetic mechanisms at the basis of these pathologies. The Laboratory of Molecular Genetics works also in the field of Pharmacogenetics / Pharmacogenomics, for the study of genetic factors that contribute to the inter-individual variability in response to drugs, both in terms of efficacy and toxicity. In this field, the Laboratory contributed to identify genes and / or allelic variants in genes involved in the pharmacokinetics and pharmacodynamics of various drugs (genes coding for drug transporters, for metabolizing enzymes, for drug targets, etc.). Identifying these gene variants may help identify individuals who might develop adverse reactions to some drugs, identify “responders” and “non-responders” patients, or identify the right dosage of a drug for each patient. The purpose of this work is to contribute, with genetic information, to establish more personalized therapies (Genomic Medicine, - Personalized Medicine). In this context, some members of the Laboratory collaborate with the Pharmacogenomics Working Party of the EMA (European Medicine Agency), as well as with several Italian institutions, contributing to the formulation of International Documents and Guidelines regarding the recent applications of Pharmacogenetics in the Clinical field, to the inclusion of pharmacogenetic studies in the production of new drugs or in the "Repositioning" of already existing drugs and to the definition of specific procedures for the Qualification of Genomic Biomarkers. The Laboratory of Medical Genetics includes also the Laboratory of Forensic Genetics, the only university laboratory accredited according to the norm 17025. The Forensic Genetics Laboratory conducts genetic analysis on all biological tissues and provides a valid technological and scientific support to the judicial system through the staff experience and the innovative available equipment. (See the specific section on the site). The close collaboration with the Medical Genetics Counseling Service of the Policlinico Tor Vergata allows to collect biological samples from patients, to have access to clinical data and to to participate to the main networks for studying and diagnosing a series of genetic diseases (EMQN, Orphanet etc. ), in particular myotonic dystrophies and neuromuscular diseases for which the laboratory is a national centre of reference. Next Generation Sequencing (NGS) through ION S5 platform (Termofisher) for the simultaneous analysis of the sequence of genes responsible for various genetic pathologies such as Cystic Fibrosis, Marfan Syndrome, progeroid syndromes, congenital and familial lipodystrophies, Myotonia of Thomsen, the main cardiomyopathies and canalopathies, and for the identification of the variants in the predisposition to the family tumor of breast and / or ovary. Studies of gene expression using microarrays or quantitative real-time PCR (QRT-PCR) on mRNA and / or miRNAs extracted from different biological samples (blood, plasma, saliva, etc. ), tissues and cell systems. Studies of DNA methylation profiles in different biological samples, tissues and cell systems: analysis of epigenetic modifications of candidate genes by HRM and DNA sequencing methods. Biostatistic studies of multivariate analysis able to evaluate the effect of genetic and non-genetic factors in response to a drug or in the susceptibility to complex diseases. Ion Torrent S5 platform for sequencing exome or targeted studies. Basic tools for cell biology laboratory (cell incubators, laminar flow hoods) including fluorescence microscope and stereomicroscope. 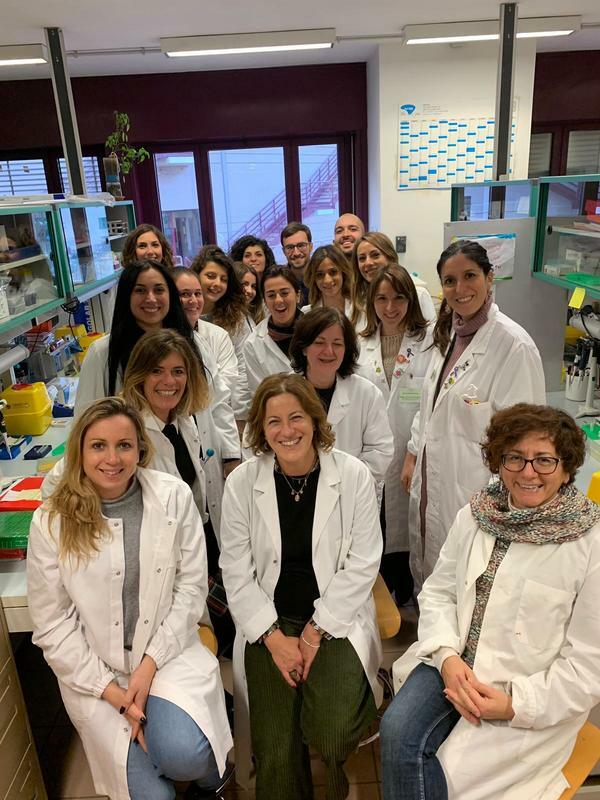 The staff of the Laboratory of Genetics is involved in TEACHING ACTIVITIES in numerous degree courses, both in Italian and in English, in numerous Specialization and Doctorate Schools in the Medical Area. The Laboratory is also includes the School of Specialization in Medical Genetics, the Cytogenetic and Cytogenomic Master (in collaboration with the “Bambin Gesù” Pediatric Hospital and the “Roma Tre” University) and the Master of Forensic Genetics.